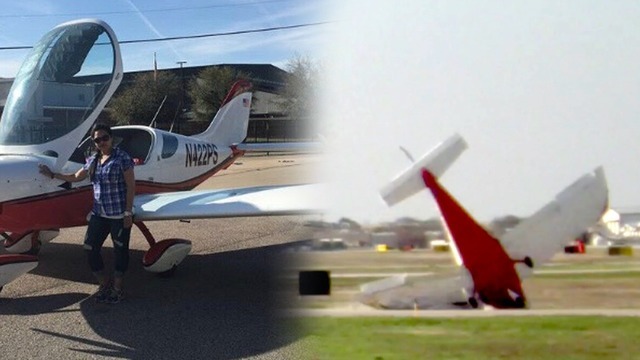 On March 10, 2018, at 1646 central standard time, a Czech Sport Aircraft a.s. Piper Sport airplane, N422PS, impacted terrain after a loss of engine power at Addison Airport (ADS), Addison, Texas. The flight instructor and passenger sustained serious injuries and the airplane sustained substantial damage. The airplane was registered to a private individual and operated by Excite Aircraft, Inc., doing business as US Sport Aircraft under the provisions of Title 14 Code of Federal Regulations Part 91 as an instructional flight. Visual meteorological conditions prevailed at the time of the accident and no flight plan had been filed. The local flight departed ADS at 1644. A review of the ADS air traffic control (ATC) recording revealed that at 1642 the pilot called ATC for a departure clearance while holding short of runway 15. At 1643 ATC instructed the pilot to line up and wait on runway 15. At 1644 ATC cleared the airplane for takeoff. At 1646 the pilot stated to ATC "we're having vapor lock, we need to come back and land." There were no further communications from the pilot. Several witnesses observed the accident airplane during the event and reported that the airplane was flying west over the southeast side of the airport. The airplane descended out of view behind several hangars and then climbed above the hangars while flying south. 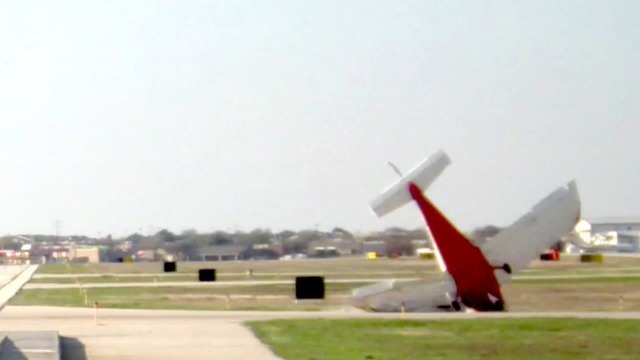 The airplane made a left climbing turn toward the runway and then descended again until it impacted terrain on the east side of runway 33 threshold. A review of the airport surveillance video revealed that at 1646 the airplane was flying southeast above the end of runway 15. The airplane descended in a wings level attitude before it made sharp left turn and impacted the ground. The airplane came to rest in the grass between taxiway A and runway 15/33 (figure 1). ADDISON, Texas - A Fort Worth mother of four says what was supposed to be a magical experience with her husband turned into a nightmare that nearly killed her. The small plane she was in crashed at Addison Airport during a demonstration ride in March while her husband looked on in shock. Miraculously, the two people on board survived. And it's been a very difficult road to recovery for Sheema Shaik. Over the last three months, she has undergone six surgeries and still lives full-time in a rehab facility. Shaik saw the inside of her own home recently for only the second time since the afternoon of March 10. 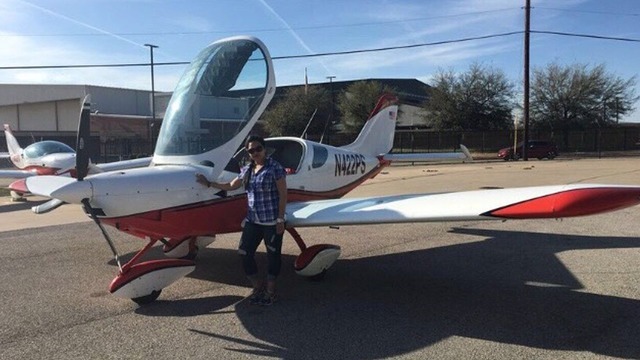 She and her husband, Touseef Siddiqui, were excited for a small plane demonstration ride. She remembers the pilot lifting off their assent. It was captured on airport surveillance cameras. “The last thing I remember, the plane was going down on the left side,” she recalled. After that, Shaik’s memory goes blank. The plane in a heap on the ground was also captured on the airport cameras. Shaik's husband was waiting to take off behind her in with a pilot in another plane. He looked on horrified and in disbelief about what had happened to the mother of his four young children. Witnesses said it appeared the plane did a nose dive from about 1,200 feet. 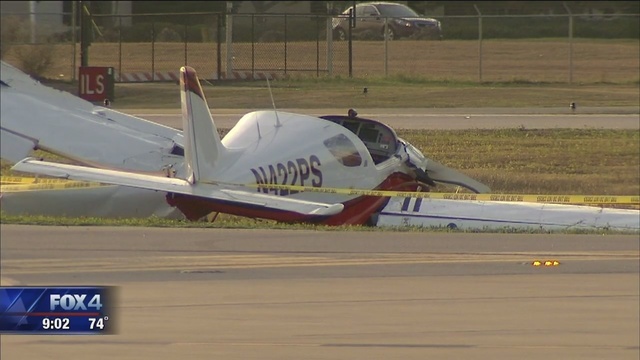 The FAA says the sports cruiser had just departed southbound when the pilot attempted to turn around and land on the runway in the opposite direction. Shaik says in addition to internal injuries, she numerous broken bones that required pins and a spinal fusion. She says the most painful thing is being away from her children, especially the little ones who can't understand. It's still unclear when Shaik will be able to return home permanently. Their attorney says the take-home message for anyone considering a demonstration flight is to be sure to ask about the experience level of instructor or pilot. He recommends sitting in the briefing room and watching them perform all pre-flight duties and even ask to see a copy of the insurance policy. Two people are in the hospital after a small plane crashed in Addison. It happened right after takeoff just before 5pm Saturday, still on airport property. 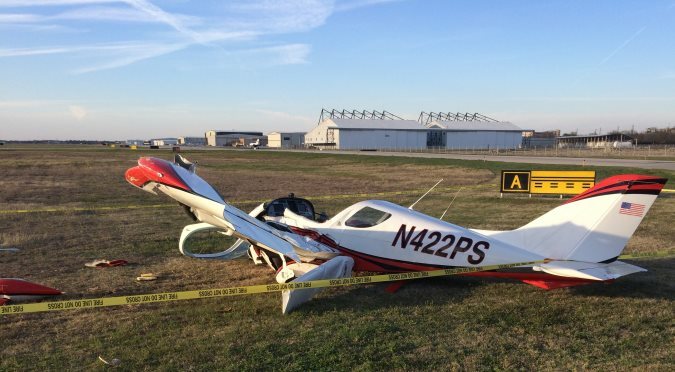 Investigators say a single-engine Piper Sport with two people on board crashed nose first at the end of the runway at the Addison Airport. “All of a sudden I looked up and he was nose diving at about 1,250 feet. Crashed right into the ground. I thought it sounded like an automobile accident but I rushed over there and the plane was down," said a witness. 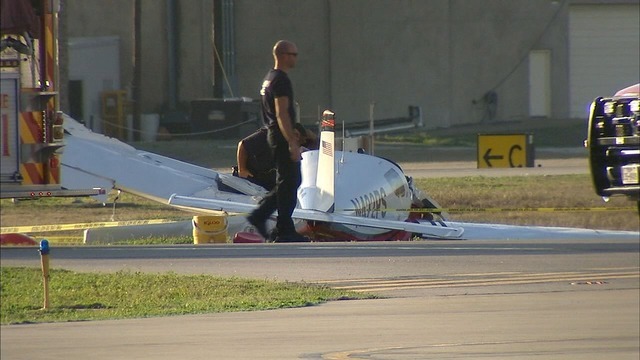 The FAA says the Czech Piper Sport had just departed southbound when the pilot attempted to turn around and land on the runway in the opposite direction, and crashed. One person was flown to the hospital by helicopter. The other taken by ambulance. Student pilot Nicolas Gallo says his flight instructor told him it was another flight instructor and student pilot at another school who crashed and it was the student's first flight. That is not confirmed by authorities. "I often fly. Almost every day. And now I'm kind of nervous since I'm seeing that this can happen why can't it happen to me so I'm pretty afraid of that," said Gallo. Pilot Mark Humphreys was inbound to Addison from Florida when he was diverted to land at Love Field because the airport shut down for several hours. "This is not good. These guys got hurt bad," he said. As a pilot, himself, he's concerned that the pilot who crashed tried to make a turn while having trouble, rather than land on a straightaway. FAA investigators made their way to the scene Saturday and the airport has since reopened. The NTSB is leading the investigation. 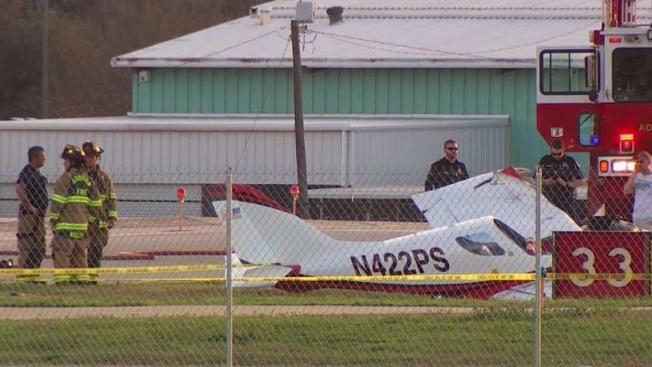 An investigation is underway after a small plane crash at the Addison Airport. Reports indicate that rescue crews have transported two people to nearby hospitals. One was taken by ground ambulance, the other flown in a medical helicopter. Investigators with the FAA say the plane had just taken off from the airport when the pilot attempted to turn around and land on the runway in the opposite direction. That's when the aircraft crashed nose first before reaching the runway. Investigators with the FAA and NTSB will both be in Addison to investigate. FAA Records show the plane is a Piper Sport and is registered to Michael Jackson in Cocoa Florida, however we do not know who was on-board the plane at the time of the crash. 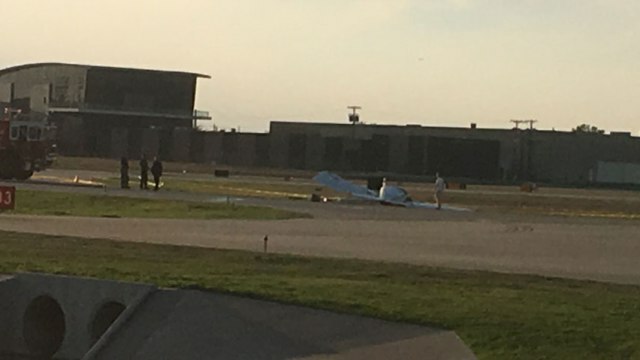 ADDISON (CBSDFW.COM) – Two people have been transported, one by ambulance and one air-lifted, after a small plane crashed at Addison Airport Saturday afternoon. Crews and ambulances are at the scene after two passengers were transported to the hospital after a plane crash at around 4:45 p.m.
Edward Martell of the City of Addison said two people took off from the airport in a Piper Sport aircraft and that it was a training flight. Martell said as soon as the plane took off from the ground, the two reported engine problems. As the plane made its way back to the ground, it crashed nose-first just short of the runway. The Addison Fire Department responded immediately and cut the victims out of the wreckage of the plane. The spokesperson said both people suffered serious injuries. Their names have not been released. I cannot say it makes any sense that an engine-out at what is estimated at 1200 feet agl over level property inside the airport perimeter should result in a nose down crash. The details (provided) do not add up. I’ve got 55 hours in this type, most of my time flying with a newly minted owner giving him instruction. With a full fuel payload of 400lbs, this airplane typically is flown at max weight at takeoff. It’s sluggish and unforgiving at typical rotation speeds, and stall spin entry is a real factor at climb out if the AOA is critical. In my stall spin experience with the Piper Sport, minimum safe recovery takes between 700 to 900 feet if you are ahead of the situation. So, at 1200 feet and at max weight the margin for error is near zero. In any event, a decision to turn back to the runway versus using the ballistic parachute or landing off airport was in this case caused a catastrophic event. Sacrifice the airplane, save the passengers and yourself. I agree all the law suits and huge settlements are dooming G.A. I remember back in the 1970's when you could buy a new Cessna 172 in the $30K range. Now that same plane costs $400K+. Inflation didn't go up the much. Haven't heard the term "vapor lock" in a while. There is a reason they call it the turn that cannot be made. One would expect a flight instructor to know better. And I agree why no parachute? These aircraft are usually equipped, and this is the correct situation to use one. Intentionally spinning piper sports? What? I am intrigued.